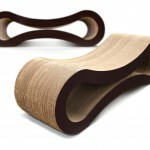 The Contoure modern cat tree is beautiful artwork that your cats will enjoy jumping and climbing on. It features solid Birch plywood, which gives it unsurpassed strength and beauty. This cat tree has four platforms that are covered in a short loop carpet that your cats will enjoy laying on. The carpet pieces are easily removed in case your kitty decides to scratch them. At almost six feet tall, this tree will prove a great perch for your cat to enjoy, and the small 22 x 26 inch base keeps it from dominating your house. The best part about this cat tree is that it is made right here in the United States. “… it will never look shabby like normal cat trees made of carpet on wood do! I highly recommend it!” – Dawna G.. The Contoure modern cat tree is a wonderful piece of cat furniture that not only looks great, but is a functional cat tree as well. In online reviews it received more 5-out-of-5 star ratings than any other rating, and it has never received a 1 star rating on a 5-star scale. The cat lovers that purchased this cat tree had so many positive things to say about it, and the feature they loved the most was its combination of function and beauty. It looks good in any home, cats love it, and it is strong enough that it still looks good after the cats have been all over it. Some customers stated that this cat tree isn’t for large cats. The platforms aren’t spaced apart enough for their abnormally large felines to navigate comfortably. Unfortunately those reviewers don’t have a fix for this issue and had to return the cat tree so that they could get a larger one. The few negative comments made about this product are all about the same issue. If the joints aren’t screwed and fitted together perfectly, the whole tree is a little wobbly. The side pieces didn’t fit into the base (or feet) of the cat tree the way they should, and because of this the tree was shaky when their cats jumped on it. These customers either returned their product for a refund or reinforced the brace with some brackets they bought at a hardware store. These same reviewers felt that given the price, the product should have been much sturdier and better fitted. Platforms aren’t spaced wide enough for larger cats. 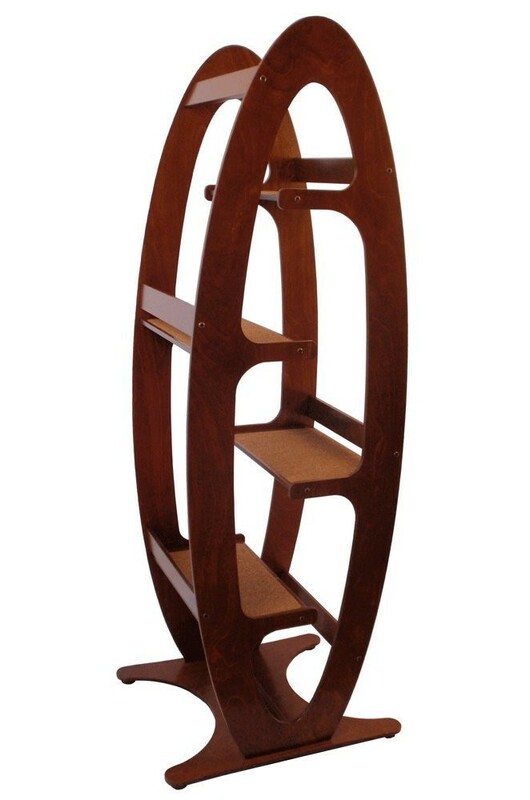 The Contoure modern cat tree’s contemporary design and elegant curves make it an artistic and beautiful piece of pet furniture. 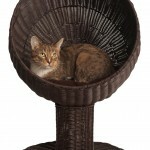 Its step-up design and carpeted platforms make it easily accessible for almost any cat. If you like to spoil your kitty with gorgeous woodwork that it will enjoy, then this is the cat tree for you.